61% of the men who were killed in the Vietnam War were twenty-one years of age or younger. The Vietnam War lasted sixteen years (1959 to 1975). The state of West Virginia had the highest death rate, based on a per capita population, with 81%. The national average was 58.9% for every 100,000 males. Only 25% of the total United States forces serving in Vietnam were draftees as compared to 66% during World War II. Approximately 2,031 people were missing in action during the Vietnam War. 766 were POWs and 114 died in captivity. The educational level of the draftees during the Vietnam War brakes down as 79% had high school or higher educations. 76% of these were from lower middle/working class families. The average age of the soldiers serving during the Vietnam War was 19. The average age of the soldiers serving during World War II was 26. Approximately 97% of Vietnam Veterans were honorably discharged. Approximately 66% of Vietnam Veterans have said that they were proud of the time in service and what they did during the Vietnam War. Approximately 87% of the general public now hold Vietnam Veterans in high esteem. Vietnam Veterans make up 9.7% of their generation. 9,087,000 military personnel served on active duty during the Vietnam Era (5 August 1964 through 7 May 1975. 8,744,000 personnel were on active duty during the war (5 August 1964 through 28 March 1973). 3,403,100 (including and additional 514,000 offshore) served in the Southeast Asia Theater which include Vietnam, Laos, Cambodia, flight crews based in Thailand and sailors in adjacent South China Sea waters. 2,594,000 personnel served within the borders of South Vietnam (1 January 1965 to 28 March 1973). Of the 2.6 million personnel who served within the borders of South Vietnam, 40% to 60% either fought in combat, provided close combat support or were at least fairly regularly exposed to enemy attack. 7,484 women served in Vietnam. 6,250 (approximately 83.5%were nurses). Peak troop strength in Vietnam was 543,482 (30 April 1969). There were 47,359 hostile deaths. There were 10,797 non-hostile deaths. Total of 58,156 (which includes men formerly classified as MIA and Mayaguez casualties). 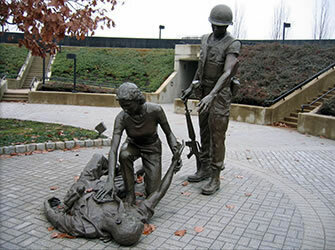 27% additional men have died of wounds sustained in the Vietnam War which brings the death total to 58,183. 8 nurses died in Vietnam – one was killed in action. 17,539 of the men killed in Vietnam were married. 303,704 personnel were wounded – 153,329 were hospitalized and 150,375 required no hospital care. 88.4% of the men who actually served in Vietnam were Caucasian. 10.6% of the men who actually served in Vietnam were Black. 1% of the men who actually served in Vietnam were of other races. 12.5% of the men who died in Vietnam were Black. 1.2% of the men who died in Vietnam were of other races. 170,000 Hispanics served in Vietnam. Of that total, 3,070 (5.2% of the total) died there. 34% of the Blacks who enlisted, volunteered for combat duty. Source of the above information, Vietnam Veterans of America, Speakers Bureau Handbook provided by the Public Affairs Committee.